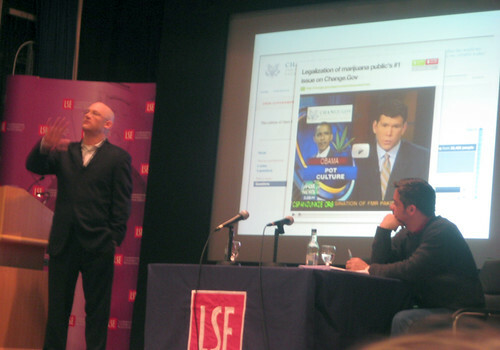 Last night I went to see the brilliant Clay Shirky in one of his visits to the UK. I'm a big Shirky fan. I can bore for England on his thoughts. This will be the third time I've seen him speak & one of those was even in his home town of New York, when I was on holiday there last September. In a nutshell Clay's best selling book "Here Comes Everybody" can be summarised in five words - "Group action just got easier". He believes that the internet has made mass collaboration easier, than it's ever been before & that through things like Facebook Groups, online forums, blogs & plain & simple email, we can get groups of people to do things on a quick & large scale. In the Q & A afterwards someone pointed out that most successful mass online collaboration comes from reacting against something - ie pointing out that something's wrong & getting people to echo & spread how wrong that thing is in the hope that the powers that be will change it. In a way the questioner was right. 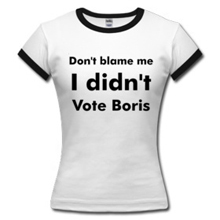 Recently there was a campaign to expose MP's concealing their expenses. A Facebook group gained over 10,000 members in 48 hours & many members wrote to their MPs & blogged and the vote to conceal MPs expenses was cancelled by the Government. I was challenged to write a post by the Carnival of Modern Liberty & thought if this something I that's relevant to this blog. However, as much as I'd like it, I can never really see mass online groups working to make real change on the London Underground. Most of the large Facebook groups are usually in the Just for Fun category - ie People who secretly pretend to drive the DLR and People who temporarily fall in love with people on the Tube. There's nothing wrong with them of course & if anything they help us put up with daily grind on the Underground. But whenever something we really moan about arises - like the annual above inflationary fare rises - nothing happens. We grin and bear it as we're basically held over a barrel - voting with our feet is like shooting ourself in the er.. foot. Same thing with Tube strikes. We moan, but what can we do? There was the famous London Underground song - which was viewed & downloaded by hundreds of thousands of people - but it didn't actually stop the London Underground from appearing to have most of the characteristics moaned about in the song. 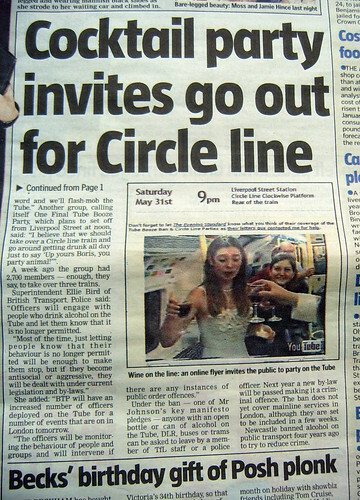 The closest we got to mass collaboration, which gained momentum through the internet was the final Circle Line party to say farewell to the end of booze on the Tube. I have absolutely no answer or solution to mobilising Tube commuters. All I try to do is to make people aware of issues which I think are interesting, wrong, funny or annoying. I know there's a lot of you who share those views. I also know that the London Underground & TubeLines at least read this blog and other London blogs. TfL even invited me & other bloggers to a bloggers briefing in advance of them launching their online tools. However, as Shirky said last night, bloggers in themselves aren't enough to make social change, no matter how well they write. Last night, we saw a slightly mellower Clay Shirky to the one who really championed the wisdom of the crowds & crowd collaboration. For the first time he said in public that mass collaboration isn't going to solve every problem. He believes that we really need a mix of bloggers, online group leaders and people doing grass roots work at a local level. He said, that good ideas come from small groups of smart people and people with a shared mission. Not necessarily a large bunch of hotheads trying to game the system. See David Wilcox's post with a video of this part of Clay's talk. He also made the very good point that nothing solidifies a group like an external threat. He half joked that those that don't have an external threat, have to have a paranoid leader, as they will soon find a threat. 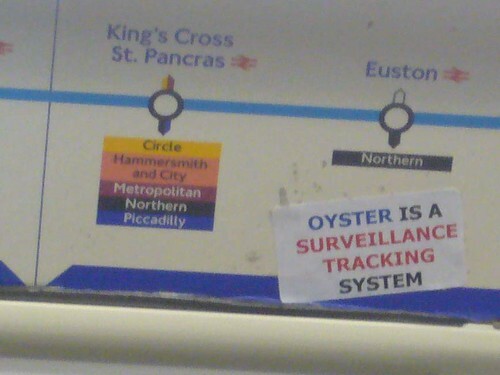 I've always been a little ambivalent towards Cory Doctorow and the Boing Boing guys when they talk about the evilness of Oyster cards. But now I see where they're coming from more, even if I don't necessarily agree with them (I seriously don't think London Underground have the bandwidth or money to do anything with a lot of information they hold on us). Part of my view change is to do with having met Cory in the flesh a few times & he's a very smart guy. But part of this, is the knowledge that nothing empowers groups more than an enemy or a threat to one's freedom (or perceived freedom) or right to knowledge. The minute our freedom to drink on the Tube or to make Oyster watches gets taken away from us, even if we'd never even thought of drinking on the Tube or making Oyster watches in the first place, that's when we might be motivated into some sort of action. Anyway, thanks for making it to the end of this post and if you've got any thoughts about this or transport campaigns you think people would be motivated into action about, let us know in the comments.